Ace #1 best fishing buddy! 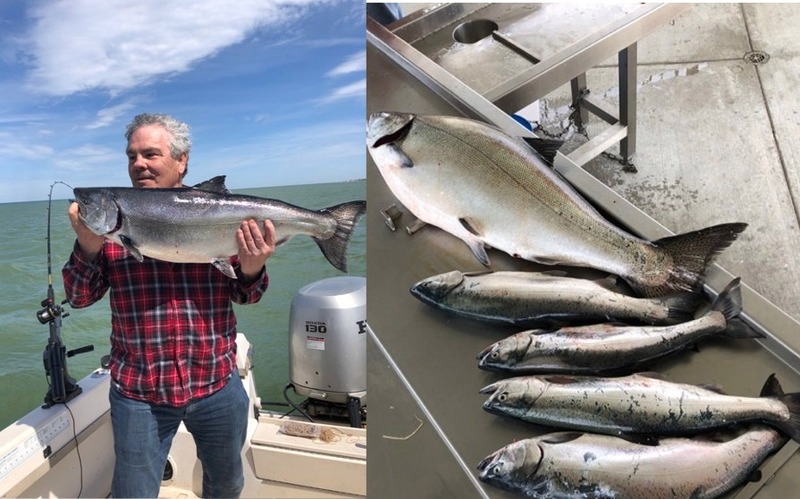 Today's Update and, ...or Fishing Report? 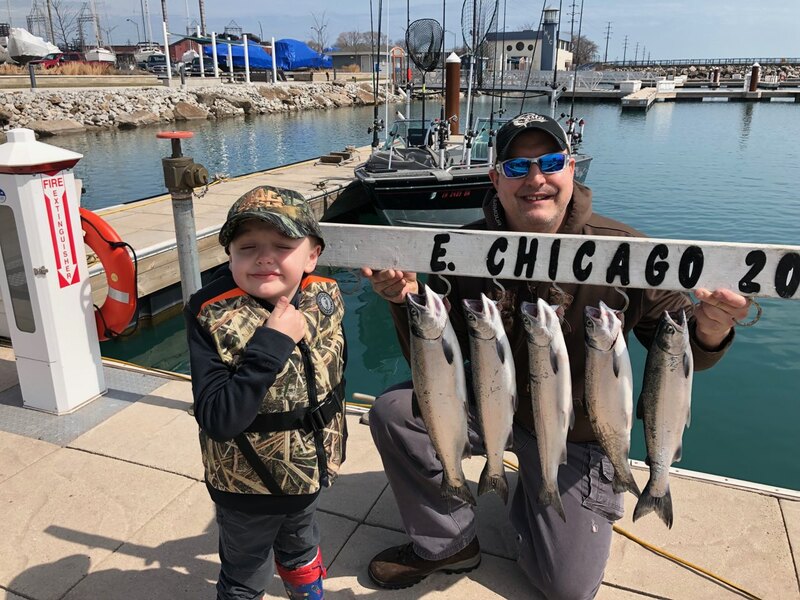 4/25/19 Today's featured Photo is from Dan A who fished out Lk. MI of the Port of St. Joe, MI a few days ago. On his morning trip 4 Coho and a 22 pound King fell victim to Capt. Dan aboard his Grady White, "Reel Women." Big news is the double digit 22# King! Just by looking at the girth of the fish in today's photo you can see clearly round plump fish not suffering from malnutrition due to lack of bait as we're led to believe! 4/24/19 I keep looking for any shred of information to plan my next trip. Inshore water warmed up some and reports of a few smelt runs is in our favor. Only thing I have for Manistee, MI is there was several boats in the harbor perch fishing and catching some. That's good news for table fish. Been reading "Something Spectacular" by the father of our Great Lakes Salmon, Howard A. Tanner. Found out State of Michigan came up with a million dollars for pellet food to feed and raise the young Coho back in 1966. That's over $7.5 mil in today's dollars to test the viability of a Salmon fishery that may, or may not work? In other words that's plus $7 mil for a shot in the dark. 4/24/19 Lack of normal inshore water temp is today's topic. About this time in April 44-50 degree water is laying just off the beach. According to a reliable source, 41° is all we can muster out of the Port of Ludington, MI. Predominate N wind has running cold water down the shore. That's about to change with a W & E winds predicted for the rest of this week. As of today at noon surface temp in Manistee is 44°. 4/23/19 Daytime high temps in the mid 70°s is not hard to take. Hope we turned the corner for better weather. About time after 6 months of cold weather...right? Wind and wave forecasts have been way off the mark. Error has been running about double of projected wave heights. Wind direction has been spot on. Only thing I'm hearing is Lake Trout out of Manistee and Ludington. Nary a peep about spring Kings yet. Brown Trout must be on the endangered species list, because they're scarcer than hen's teeth. Early season Browns have been close nonexistent. Looking for a window to sneak away for a 1/2 day, but must contend with a lot of rain this week. Rain is OK. Rain lessens fire danger the dry woods where I live. Had a forest fire, (mostly ground cover) burning adjacent to my property 5-6 years from a downed power line. That was scary! & good sense of humor." 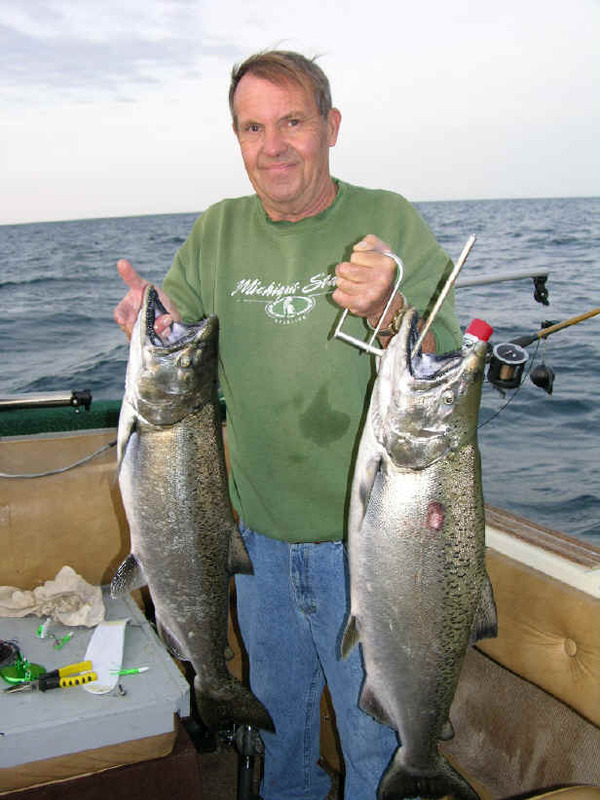 Guy Ellis-The Outdoor Guy "Manistee News Advocate"
"King of the Charter Boat Skippers"